Hello again! I am here to share with you today a classic outfit that is perfect for a casual office, lunch with the girls, or a less-fancy date night. Also, I love this outfit idea for a holiday party! The green says Christmas without being too in your face, and you are still plenty comfortable. I love the mix of kelly green with dark denim and cognac leather. The colors just work so well together and I like the way they look with my skin tone, eyes, and hair color. 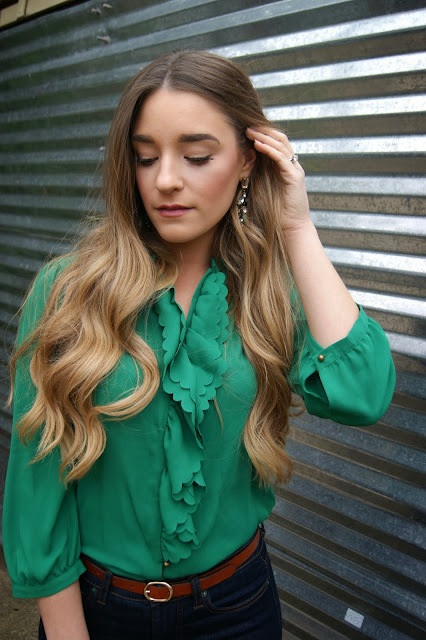 This shirt is so silky and easy to throw on with jeans or dress up with a fun skirt. These high waisted jeans are quickly becoming a favorite staple in my wardrobe. Once again, I cannot get over these beautiful shoes! Thanks so much mom for the lovely gift!!! I hope this outfit inspires you this holiday season! I always get major hair envy when I visit your blog! p.s. Check out the fun little giveaway I'm hosting! Love love love the boots <3 beautiful outfit.